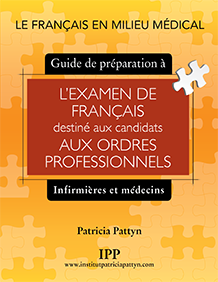 The goal of the exam is to ensure that you have a knowledge of French “appropriate for the practice of your profession.” This means that the oral and written components of the exam will be related to what you do on a daily basis in your practice: Understanding the psychosocial history of a client, defining the current problem/issue, setting objectives and establishing an action plan, explaining to clients the type of therapy that you propose, etc. using grammar adequately to express, for example, the difference between a suggestion and an obligation, a possibility or an established fact, and to construct proper sentences. We will base our program on your work as a healthcare and social services professional and the cases that you encounter frequently, and you will learn to present and develop your responses to questions in a simple and precise way. You will be able to strengthen your grammar and your vocabulary through practical application exercises and scenarios that will be familiar to you. Communicating with a client requires understanding what they are saying. If you have difficulties with comprehension then we will propose various resources to help you improve this area which is essential for your success. There are fundamental rules of agreement which you must adhere to during the exam. In addition, and this is one of the difficulties with written French, we do not always hear the difference between two endings, but the difference exists and will be visible when written. We will study these by means of practice exercises and scenarios. The preparation that we offer is practical, concrete and complete. To pass the exam, your response must be clear and precise. No need to make it complicated!